A Brooklyn Christmas tree salesman shares his tips and tricks for selecting the best one on the lot. If you celebrate Christmas, the smell of a real tree wafting through your home can add a ton of ambiance to your holiday. Before you set out to bring one home, there are some potential negatives to reconcile — fear of fire, needles shedding all over the floor and the temptation for misbehavior it gives to your pets (we're looking at you, kitty). If you get past all that and are intent to proceed in your quest for a great real tree, we spoke to longtime tree salesman, Karod “Randy” Randolph at Mazzone’s Hardware on Court Street in Brooklyn, and gleaned his tips on how to score — and care for — an awesome tree. When it comes to buying a tree, you’ll have to weigh how long you want to have it against how much you want to pay for it. 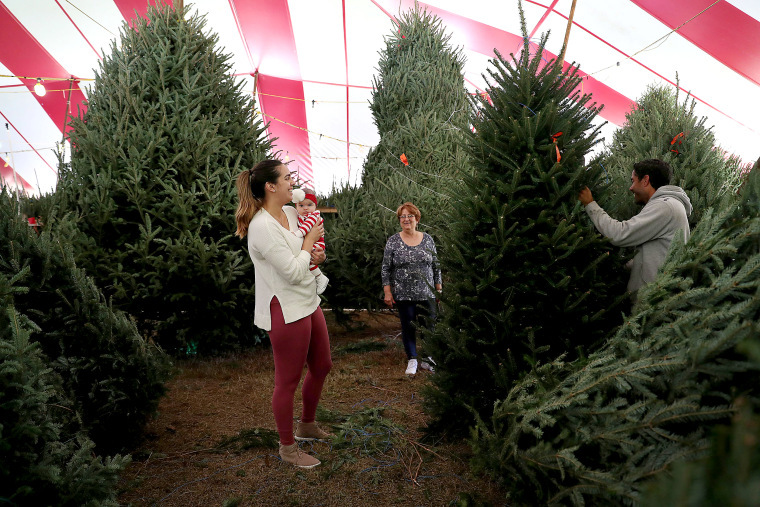 According to a report by Square and the National Christmas Tree Association, if you haven’t bought a tree yet, you’re probably saving some change — Cyber Monday is said to be the most expensive days to buy a tree at $81. After that, the first Saturday and Saturday in December prices hover around $74 but otherwise they slide steadily until the holiday after the second week of December. Sometimes the tree picks you and not the other way around. Trees are a matter of taste, some like them short and fat, others like them tall and lean. “Sometimes the tree picks you and not the other way around,” says Randolph, who always unties the tree in front of his customers so they can inspect their width, density and how it looks. He says to steer clear of trees with any brown or yellowing needles. “Christmas trees are all dead. They start off dead. If you have something that looks dead when you buy it, it’s only going to get worse,” he says. Pick up the tree and bang the trunk on the ground. If a lot of needles fall off, pick another one. Though Balsams and Douglass trees are popular, Mazzone’s only sells Frasier fir trees. “Frasers cost a little more however they have the least amount of complaints because they don’t shed as much as the others,” he says. Frasiers also happen to be the favored tree of the White House. Whichever tree you choose, be sure to keep it away from any source of heat, like a radiator, fireplace or stove, when you set it up at home. When you pick out a tree, don’t forget to inspect it carefully for any nests or creepy crawlies before shaking it out really well, and having it wrapped in netting to avoid leaving a trail of needles, says Randolph. Most tree sellers use a shaking machine to help shed needles and those pesky critters. Whoever sells you your tree should prune off the tiny branches at the bottom, leaving about 8”-12” of trunk to place in the stand. Also, Randolph says trees are usually cut at the farm in a slant. Careful to preserve the height as much height as possible, he cuts the trees straight across the bottom and cuts a divot into center of the bottom of the trunk, so the tree absorbs as much water as possible. Hydrated trees can last up to a month, if not longer, he says. And pay attention to your health while you're at, too. When hauling it off the lot, save your spine by carrying the tree out with the trunk in the front, heaviest forward part for better balance.